The holiday season is once again upon us. Embrace it and share a meaningful moment, a smile, or a hearty chuckle with family and friends at the dessert table this year. Tart cranberries are creamed with cream cheese, swirled with honey and a hint of cinnamon for a fun and festive new way to enjoy the classic berry. 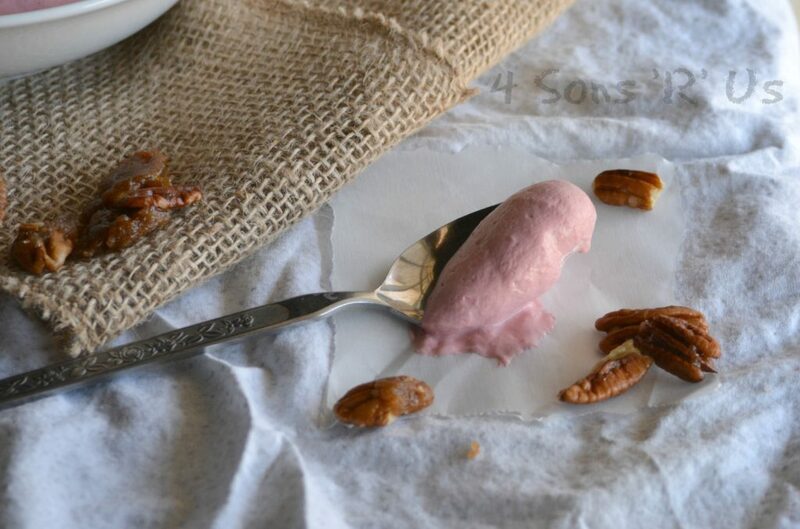 Finished off with fresh, candied pecans this Creamy Cranberry Dip with Candied Pecans is sure to bring a smile to anyone it meets. Thanksgiving is only a week away. Half of my friends are already sharing pictures of their Christmas Trees. I’m just waiting to see who has the gumption to put up their lawn decorations first. While I love Christmas as much as anyone can possibly love this most magical of holidays, but I also love our family traditions. And yes, in our home– even pulling the decorations down from the attic is tradition. After everyone has emerged form their tryptophan carbohydrate-induced stupors, and all the dishes have been washed, dried, and put way– Daddy climbs up into the attic and pulls down all of Mommy’s Christmas Bins. I won’t even tell you how many I have– I’ll just point out that my Mama said “If you aren’t going to do something all the way or give it your all, it isn’t a thing worth doing.” Then we ’til morning. While the Hubs and I do enjoy venturing out to the store on Black Friday, with one or more of the kids in tow, to see if we can grab a gift someone won’t be expecting under the tree– that’s not what our day after Thanksgiving is all about. The day after Thanksgiving is the day we all pile into the family vehicle and head out to the country to the *local* tree farm. After an hour or so of walking around, scrutinizing row after row, and one or two intense debates we settle on and saw down our Fir for the year. The evening is filled with tree trimming, frosty glasses of Egg Nog, rehashing old stories over various ornaments with Christmas carols playing softly in the background. That is what the beginning of the season is, and will forever be for me. Everybody else– do your thing, make your own traditions, make your own memories. It can’t ever be too early in the year for spreading goodwill and cheer. All that aside, this year I’m looking forward to introducing my clan to a new tradition in the menu dept. 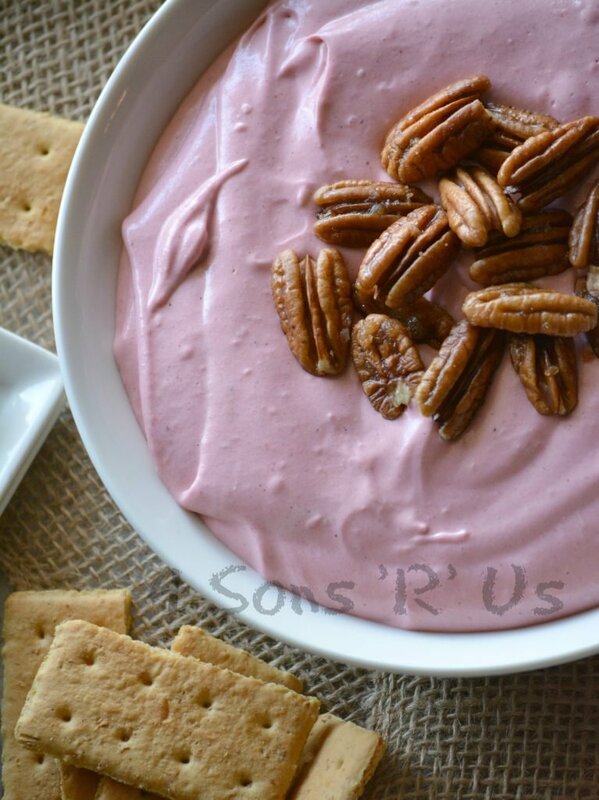 This Creamy Cranberry Dip with Candied Pecans to be exact. Some good finger food on the coffee table to go with our egg nog while we take our time and just enjoy each other’s company. 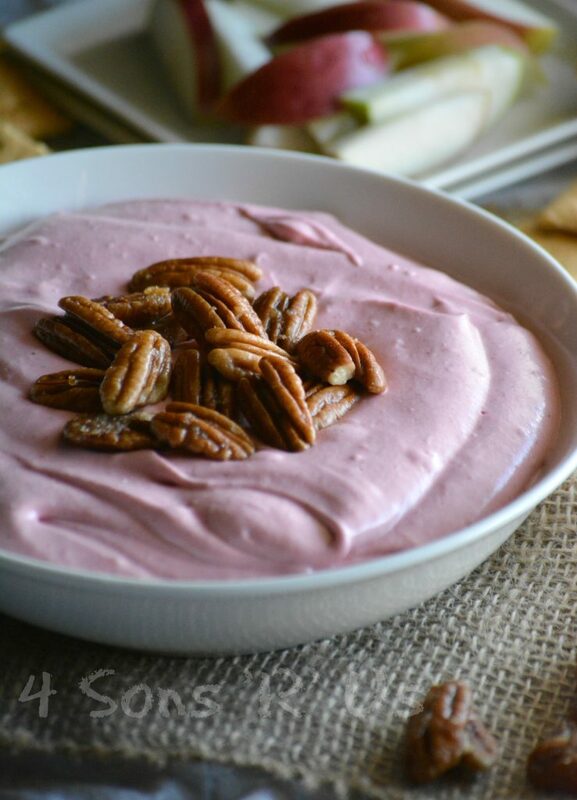 Cranberries are synonymous with the season, and in this creamy dessert dip they’re churned with cream cheese, a swirl of honey, and finally just a hint of cinnamon. This yummy recipe alone will be responsible for inducing Christmas cheer and goodwill to your fellows– wherever it goes with you. A fun and festive dessert dip that's perfect for sharing with family and/or friends during the Holiday season. Either to the bowl of a stand mixer, or to the bowl of a food processor, add the cranberry sauce, honey, lemon juice, cinnamon, and salt. Blend, or whip, until the mixture is smooth and all ingredients completely incorporated. If using the food coloring, add your drops now and blend once more until the color is consistent throughout. Taste and adjust honey and/or cinnamon, as desired. Transfer the dip to a serving bowl, and refrigerate (covered) until ready to serve. Heat a medium-sized skillet over medium heat. Add the butter, stirring as it melts to prevent burning. As soon as the butter's melted, stir in the nuts, honey, and sugar. Heat the mixture, stirring occasionally, for about 5 minutes. Spread out a large, clean piece of parchment paper onto a clean work surface. Transfer the candied nuts to the parchment paper, using a rubber spatula to spread into a single layer. Let the nuts cool completely and the candied coating completely set. Gently remove the nuts from the parchment paper, breaking up as you go. Sprinkle them into an even pile on the center of the cranberry dip. 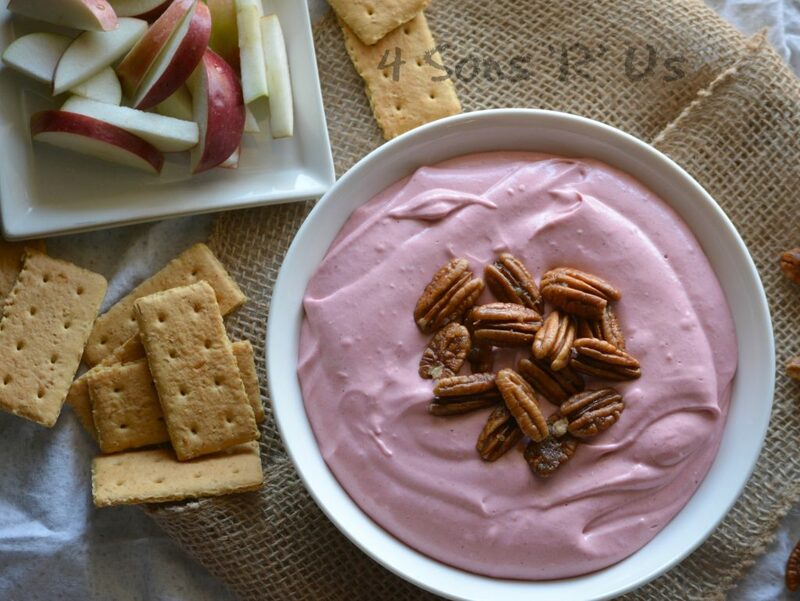 Serve this dip with pretzels, graham crackers, or sliced fruit-- such as apples. Such a cool recipe! I can just imagine how delicious this is, and I bet sometimes it is tempting to eat it with a spoon 😉 Have a wonderful tree finding adventure next week! Thank you for bringing this yummy and creamy creation to Fiesta Friday! This looks delish and what a great way to use up any leftover cranberry sauce! I bet it would be good with the chunky sauce, too. Hope you had a wonderful holiday!